There is always present a segment of the rich and the affluent who wish to spend their vast fortunes wisely, when it comes to luxury travel, specifically in the case of luxury yachts. This is where most expensive yachts to charter comes into play. Numerous millionaires and financially comfortable individuals around the globe dream of sailing on the pristine blue waters, but are wary of investing millions of dollars in luxury superyachts, largely due to the fact that these boats are not only expensive to buy, but equally pricey to maintain as well. However, the private yacht charter services provide these enthusiasts with the means of fulfilling their desire without having to worry about the expenses of owning a luxury megayacht. What luxury yacht charters offers, is the freedom of acquiring a luxury yacht on rent and enjoy its bespoke comfort and amenities for a specific amount of time and then handing it over back to its owner. It is not only the money conscious customers who prefer to charter luxury yachts rather than buy them, the owners of these magnificent yachts for charter are also increasingly getting in to the charter groove. 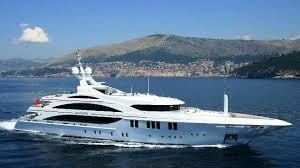 Numerous high profile yacht owners such as the likes of Roman Abramovich, Rupert Murdoch, Steven Spielberg etc. have begun to offer their prized possessions on charter services, realizing that the amount earned via the ‘rent’ can just as easily be used for the vessels’ maintenance, without having to dip into their accounts. 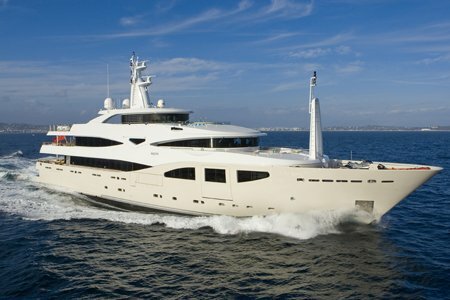 Here at AlexNoudelman.com, we are a big fan of luxury yachts and hence have taken this opportunity to present to our readers, a comprehensive list of the top ten Most Expensive Yachts To Charter. Enjoy the read. The superyacht Eclipse is by far the most elegant and feature packed luxury boat in existence and is owned by none other than the globally renowned Russian tycoon, Roman Abramovich. 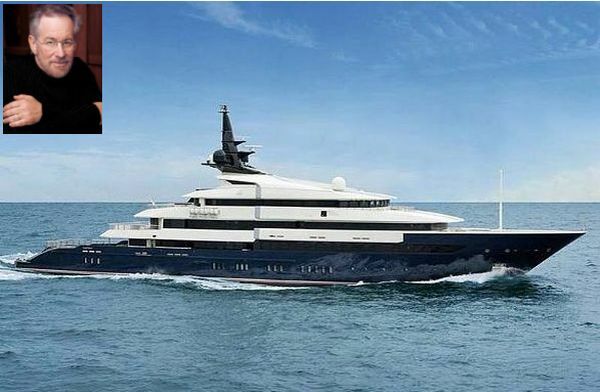 With a price tag of a whopping $400 Million to $800 Million, this megayacht requires nearly $50 million a year just for maintenance and to keep the vessel operational. In light of such high upkeep cost, it seems the best alternative for Mr. Abramovich was to advertise his proud vessel as also a private yacht charter. Available for a staggering $2 million a week, the Eclipse is the most expensive yachts charter that has been exclusively made available by SuperYachtsMonaco. The queen of luxury yacht charters, Eclipse features a military-grade missile defense system, armor plating and bulletproof windows, while dominating the realm of luxury with its three helipads, a private theater and a fitness center. The Eclipse spans over 557 feet in length and provides a spacious 5,000 square-foot master suite that comes along with a six feet home cinema screen. 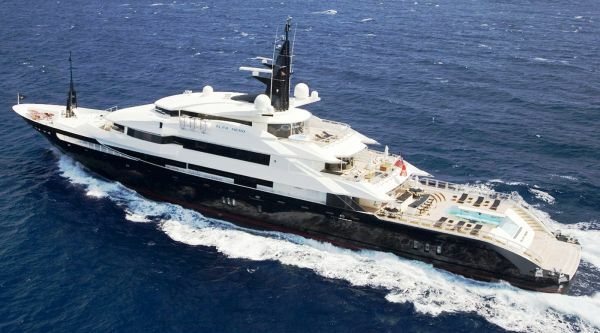 Acclaimed Hollywood director Steven Spielberg prefers to spend his free time on the blue waters sailing on his $200 million luxury megayacht Seven Seas. This gorgeous 282 feet superyacht is also one of the most expensive yachts to charter as the vessel is available for charter services with a massive price tag of $1.3 million per week. The Seven Seas was custom developed by Netherlands shipyard Oceano and was intricately designed by Nuvolari & Lenard. Built for extreme luxury and comfort, this bespoke boat can accommodate up to 12 guests and 26 crew members, while featuring a separate private owner’s deck that come with its very own master stateroom, as well as a private study. The Seven Seas has also been given a private deck area that boasts of a Jacuzzi and private VIP cabins. However, the most striking feature of the Seven Seas is its infinity pool that comes with a 15 foot glass wall, which can be used a movie screen for unmatched entertainment. The interiors of the yacht are crafted from are rosewood, teak, and walnut, while this bespoke vessel also provides its guests with the comforts of a fully equipped gym, a spa room and another indoor cinema room. Designed and developed by Oceano, the Alfa Nero is a stellar luxury megayacht that provides the best of elegant design and bespoke comfort. Measuring a full 269 feet in length, the Alfa Neo is now available for charter services via YCO and is widely regarded as one of the most expensive yachts to charter. The vessel which is a great new addition to the growing list of yachts for charter is powered by twin MTU diesel engines that give the boat a maximum speed of 20 knots and the superyacht is more than capable of cruising vast distance with a maximum range of 5,000 nautical miles. Overall, the Alfa Nero provides an astounding 4,000 square feet of opulent living space for 12 guests and 28 crew members. On the inside, the occupants are presented with three separate dining areas, a dance floor and even an elevator that has been crafted from glass. 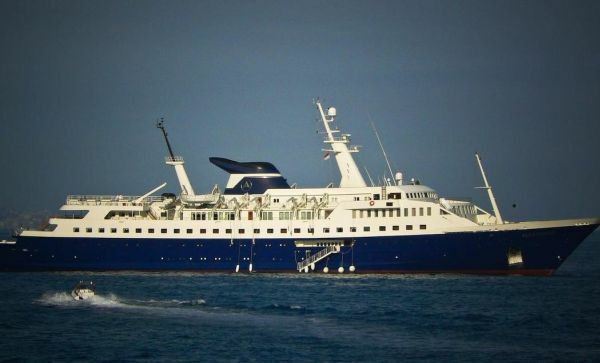 With a weekly charter price of an eye popping $1.2 million, the Seven Seas was officially launched in the year 2007 and since then has been capturing the hearts of numerous guests who have availed the luxury yacht charters services offered with the Seven Seas. 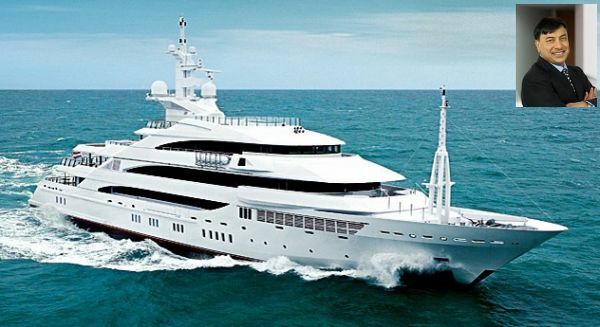 Lakshmi Mittal, the world renowned billionaire and the owner of the world’s biggest steel company Arcelor Mittal is also widely known in the luxury circles for his luxury megayacht, Amevi. This gorgeous boat has now become a vital element of the private yacht charter business, as the superyacht is now available on a rental model with an asking price of an astounding $1 million per week. Evidently one of the most expensive yachts to charter, the Amevi was designed and developed by Oceano and gleams of a magnificent that is equally complemented with a slew of the most opulent modern amenities imaginable. One of the most fabulous yachts for charter, the Amevi can accommodate up to 16 guests and 22 crew members. The luxury megayacht was launched in the year 2007 and spans 262 feet in length, while featuring a cinema, gymnasium, heated pool, massage room and hairdressing salon, along with a private Jacuzzi. From an engineering standpoint, the most striking feature of the Avemi is its state-of-art Rolls Royce “zero speed” retractable stabilizers, while the boat boasts of a private study, a changing room as well as another Jacuzzi in the master suite. Launched in the year 2005, the Alysia Moonlight II or more commonly referred to as Moonlight II is a luxury megayacht that is also hailed as one of the world’s largest yachts, thanks to its 85.3 meter super structure. Counted among the elite of the most expensive yachts to charter, the Moonlight II is composed of a steel hull and the deckhouses have been crafted from aluminum. This private yacht charter vessel is more than capable of accommodating up to 36 guests along with 34 crew members and the designers of this fabulous boat have given a maximum range of 7,000 nautical miles. On the bespoke comfort side of the equation, the megayacht features 18 lavish staterooms and 18 bedrooms, while the Moonlight II also carries a special private master suite that has been provided with its own Jacuzzi, private study and even a private deck. One of the most alluring amenities of the luxury superyacht is its temperature controlled wine cellar with a 500 bottle capacity. Furthermore, to ensure that the guests leave with nothing but the most cherished memories, the Moonlight II offers a movie theater, hair and beauty salon, gym, children’s play room and a helipad. There is also present a dedicated business center for the mobile tycoons, along with a dedicated spa deck that sports its very own Jacuzzi. Designed and developed in the year 1965 by Lubeker Fender Werke, the luxury megayacht Alexander has now found a place in the prestigious list of the most expensive yacht charters. This exquisite and feature packed megayacht is at the helm of the portfolio offered by private yacht charter services. The Alexander underwent a thorough upgrading process and in the year 1998, the vessel was finally categorized as a luxury megayacht. Powered by two MAN diesel engines, this luxury vessel is capable of achieving a maximum speed of 18 knots, while sporting a cruising speed of 15 knots. The entire superyacht measures 122 meters in length and is more than capable of accommodating up to 80 guests, while providing ample living means for its crew of 60 people. The Alexander features 40 luxurious guest cabins and a separate master suite that comes with its salon, as well as an en suite that sport a private Jacuzzi. Among other amenities, this royal megayacht also comes with a helipad, a small infirmary, a fully equipped gym, a music and even a children’s play room. For those seeking upscale entertainment, the vessels offers a big movie screening room with an occupancy of 27 seats, while also boasting of a disco bar, along with a magnificent pool deck that is comprised of a pool and Jacuzzi. 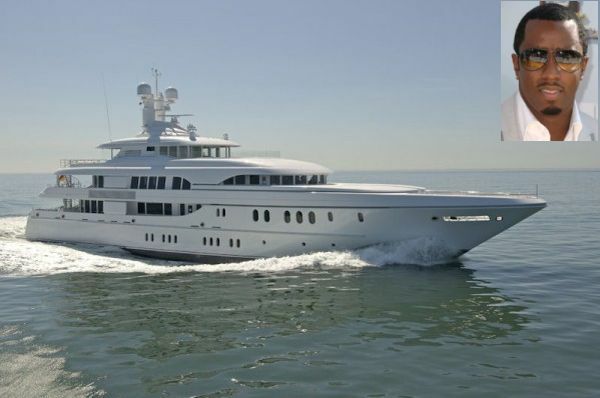 The Alexander is available for charter services from Privatsea Yachting with a price tag of $899,120 per week. One of the foremost and highly revered German shipyards, Lurssen Yachts brought together the bespoke comforts of a superyacht and the versatility of an Apple iPad with the launch of the luxury megayacht Solemates II. Introduced in the year 2010, this superyacht carries stunning interior designs that were accomplished by the highly renowned artist Glade Johnson, while the exterior of the boat was designed the famed superyacht designer Espen Oeino. Hailed as one of the most expensive yachts to charter, the Solemates II carry a rental price tag of a whopping $600,000 per week. The megayacht measures some 190 feet and can easily accommodate 12 guests in opulent luxury, along with a crew of fourteen. The vessel is powered by a twin Caterpillar engines that give the superyacht a maximum speed of 15,5 knots and a range of 7,000 nautical miles. However, the most alluring feature of the Solemates II is its deep integration with the iPad tablet, where in the captain of the ship give out the tablet device to all the guests, who can then use it to control the various entertainment features of the boat. The iPad is given a custom application that enables the guests to wirelessly control the lights and climate systems, entertainment systems and even gives them the ease to summon the crew all by tapping and swiping on the tablet. The Solemates II feature a grand and spacious sun deck that sports its own bar and a Jacuzzi, while the superyacht also boats of a spa, a fully equipped gym, along with six cabins, a master suite and four additional guest cabins. Owned and operated by the founder of Asset Management, Elena Ambrosiadou, the Maltese Falcon is a 288 feet luxury yacht that is now available for charter with a price tag of $554,825 per week, thus making it one of the most expensive yachts to charter. The megayacht was designed by Perini Navi Italy and employs a revolutionary new sailing system called, DynaRig sail system, where in the three masts of the vessel are crafted entirely from carbon fiber. Designed to be a hi-tech sailing vessel, the Maltese Falcon has been fitted with a cutting edge computer system that takes care of the yacht’s operations, while the boat even comes with a highly trained crew of 18. With a capacity to accommodate 18 guests, no stone has been left unturned to ensure that the Falcon offers nothing but the very best of luxury. Considered to be one of the world’s largest privately-owned sailing yachts, the Maltese Falcon provides ample water sporting opportunities with the availability of two 32 foot Pascoe RIB Tenders with water skis and four laser sailboats. Furthermore, for those who wish to be pampered in the lap of luxury, the superyacht offers a 50 inch plasma television located in the main saloon and the master, while 40 inch plasma screen dot all the guestrooms. Also, present throughout the boat is a bespoke Bang & Olufsen surround sound system and the guests are also provided with various connectivity solutions such as GSM cellular services and high speed wireless Internet connection. Powered by twin 2 Deutz TBD620 engines, the Maltese Falcon can attain a top speed of 18.5 knots, while sporting a maximum range of 3,000 nautical miles. 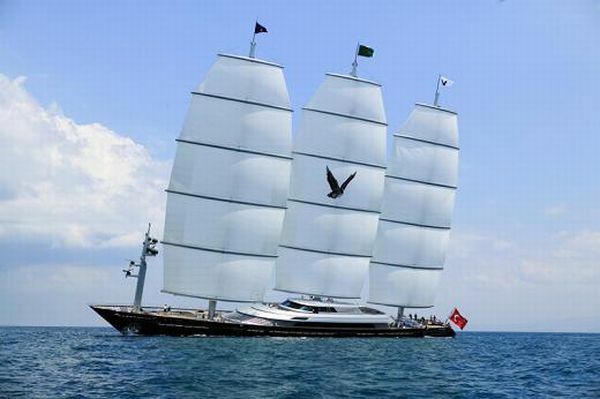 The Maltese Falcon can be acquired on charter basis from Burgess Yachts. Designed and developed by the famed CRN Yachts Ancona, the Maraya is a fabulous luxury megayacht that brings together breathtaking aesthetics and some of the most fanciful luxurious amenities imaginable. 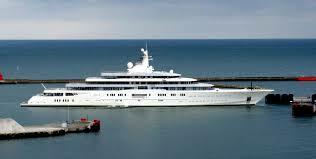 Introduced in the year 2008, this boat sits at the very top of private yachts to charter and spans 177 feet in length. The superyacht is capable of accommodating up to 12 guests, along with a crew of 15 and features six lavish staterooms, while the vessel itself served as the host to the famous rapper P. Diddy, who chartered the Maraya in the year 2008 for his Cannes Film Festival performance. 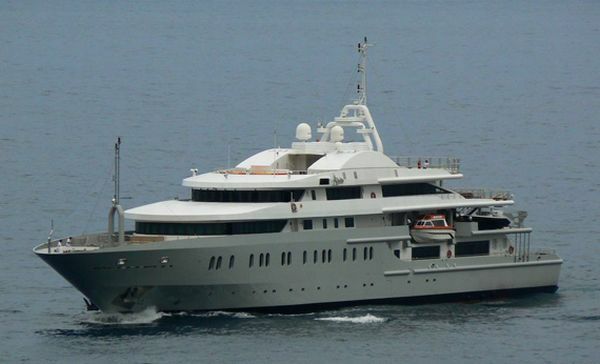 This luxury superyacht has been designed by the iconic interior designer Claude Misser. The boat is powered by two CAT 3152B chp engines that enable the Maraya to achieve cruising speed of 14 knots. With a charter price of the $476,739 per week, the megayacht is hailed as one of the most expensive yachts to charter and feature a fabulous sundeck that has been given its very own bar and Jacuzzi. Furthermore, guests on board the vessel will be offered a spacious and bespoke living spaces, while there is also a separate master suite located on the main deck that comes with emperor sized bed and there is also present a VIP cabin on the upper deck of the luxury yacht. Renowned luxury yachts charter provider Liveras Yachts, has now announced the availability of yet another luxury superyacht for charter. The Andreas L is a luxury superyacht that measures 196 feet and is manned by a dedicated international crew, which is appointed via a rigorous selection process. Designed and developed by Benettie, Anderas L features a gorgeous interior design that has been accomplished by famed designer Redman Whiteley Dixon and the superyacht guarantees bespoke luxury for its guests throughout their journey. The Andreas L is a vast vessel that is comprised of just about every modern amenity imaginable. Guests aboard this luxury superyacht will be able to take full benefits of a fully equipped gym, a massage room and even an illuminated Jacuzzi. To ensure ample watersport options, Andreas L comes with a wide range of water sport equipment, such as the likes of two stand-up paddle boards, a jet ski, diving gear, an inflatable slide, a water trampoline, two Malibu kayaks, water skis, wetsuits and even a 32 foot Intrepid tender. This majestic luxury megayacht is designated to operate in Eastern & Western Mediterranean, the Caribbean and as far as the Indian Ocean. Regarded as one of the most expensive yachts to charter, the Andreas L can be hired for a weekly price tag of a staggering $441,350.